The Man’s Promise is a three-masted sailing ship, 105 feet long and 30 feet wide (see the Skull & Shackles Player’s Guide). A minimum crew of 20 is required to sail her. Unless otherwise indicated, interior walls on the ship are of wood, 2 inches thick (hardness 5, hp 20, Break DC 20). Doors are of good wooden construction (hardness 5, hp 15, Break DC 18). Interior rooms are unlit during the day (except for those with windows or portholes), and usually have a single hooded lantern for light at night. The decks and compartments of the Man’s Promise are detailed below. The ship is currently empty beyond common items such as hammocks, lanterns, rope, and a few other mundane objects. B1. Main Deck: Two 10-foot-square hatches sit in the deck forward of the mainmast and open onto the middle hold. Between the hatches and mast, a steep set of wooden steps descends into the middle deck (area B8) 15 feet below. B2. Foredeck: The foredeck rises 10 feet above the main deck. The ship’s nameplate on the hull reads Man’s Promise. A second nameplate beneath that one reads the Motley. Marks in the hull suggest that a previous nameplate existed before that one, too. B3. Aft Deck: The aft deck sits 10 feet above the main deck, and steps lead up to an even higher deck behind the mizzenmast. The ship’s wheel stands just before the rail overlooking the main deck. B4. 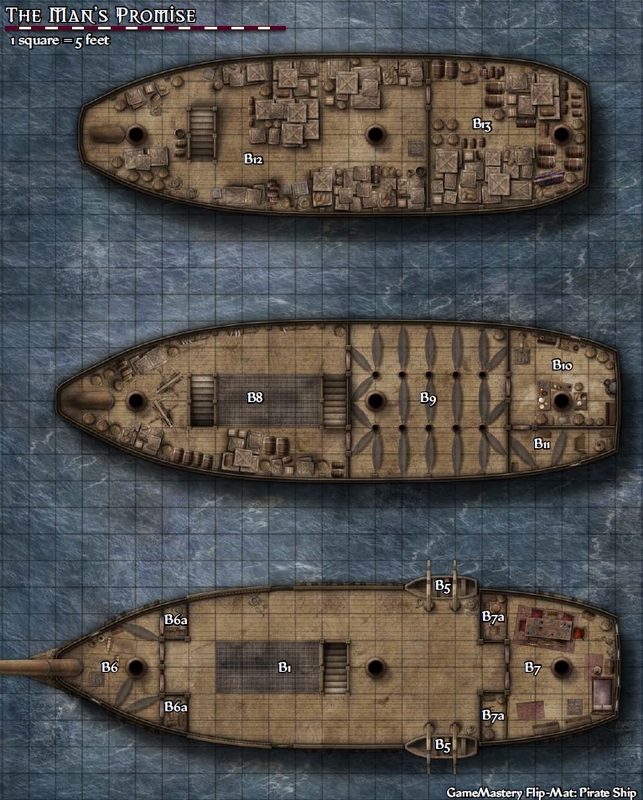 Sterncastle: This high deck sits behind the mizzenmast, 20 feet above the main deck. A pair of light ballistas sit upon this deck, next to a box containing a dozen ballista bolts. B5. Ship’s Boats: Two ship’s boats, a cutter and a gig (see the Skull & Shackles Player’s Guide for statistics), hang from davits on the gunwales just forward of the aft deck. The boats are lashed to the ship and require three DC 10 Profession (sailor) checks or Dexterity checks to launch. Each such check is a full-round action. Each ship’s boat has four oars and a single mast. The cutter can carry up to 12 Medium passengers, while the gig can carry up to 8 Medium passengers. B6. Officers’ Quarters: This tidy cabin has two portholes to allow light and fresh air to enter. A hefty trap door sits in the floor, leading to the middle deck (area B8). B6a. Officers’ Storage: These two storerooms are both unlocked and hold the lockers and personal effects of those pirates berthed in the officers’ quarters (area B6). B7. Captain’s Cabin: The rear wall of this luxurious (by pirate ship standards) cabin holds four gilt-framed windows that rise the full height of the chamber. The cabin contains a luxurious hammock (a hospitality’s hammock), a dining table and chairs, and a few chests and bookshelves. A trap door opens directly into the cook’s cabin below (area B11). The two doors opening onto the main deck and the trap door are locked with good locks. The windows do not open. B7a. Captain’s Storage: These small storerooms do not have doors, but are separated by sliding walls that can also be removed and made into a folding table. The starboard compartment contains a small writing desk and a couple of chests. One of the chests is locked with a good lock. B8. Middle Deck and Armory: The middle hold of the Man’s Promise is currently empty, though the weapon racks along the walls only need to be restocked to turn this hold into a working armory. Steps behind the foremast descend into the main hold (area B12). A second set of stairs against the aft bulkhead lead up to the main deck (area B1). B9. Crew Berths: Ten supporting pillars behind the mainmast fill this spacious compartment, with room for over a score of hammocks. B10. Galley: This sizable galley contains a large stove against the aft bulkhead and a single porthole in the starboard wall. In one corner, a derrick stands next to a trap door that opens into the secure storage below (area B13). The door is locked with a huge, good padlock. It takes a full round to raise or lower the line on the derrick, which can lift up to 200 pounds of cargo. The galley has been stocked, but the food is scant at best. B11. Cook’s Cabin: This filthy cabin contains two dirty hammocks and a single porthole in the port wall. A rickety ladder ascends to a trap door in the ceiling, leading to the captain’s cabin (area B7). Ambrose Kroop sleeps here, and he has also stashed a small barrel of rum he managed to secure from Cut-Throat Grok before leaving the Wormwood. B12. Main Hold: Essentially empty after being looted by the crew of the Wormwood, the main hold of the Man’s Promise contains a large water barrel secured to the starboard wall. Stairs behind the foremast lead up to the middle deck (area B8), while a trap door near the mainmast leads to the bilges, which contains two bilge pumps, forward and aft. If anything, there are more bilge spiders there than in the Wormwood. B13. Secure Storage: This large compartment aft of the main hold is locked with a good lock. Other Gear throwing axe, cutlass, dagger, sap, basic pirate clothes, personal effects such as cheap earrings, leather belt, lucky rabbit’s foot, hat with a parrot feather plume, etc. During Combat Pirates fight according to their loyalties. They always look out for themselves first, but aid those they are helpful to next. Morale A pirate withdraws from combat when reduced to 6 hit points or fewer, and flees when reduced to 3 hit points or fewer. The cutlass appears in Pirates of the Inner Sea.